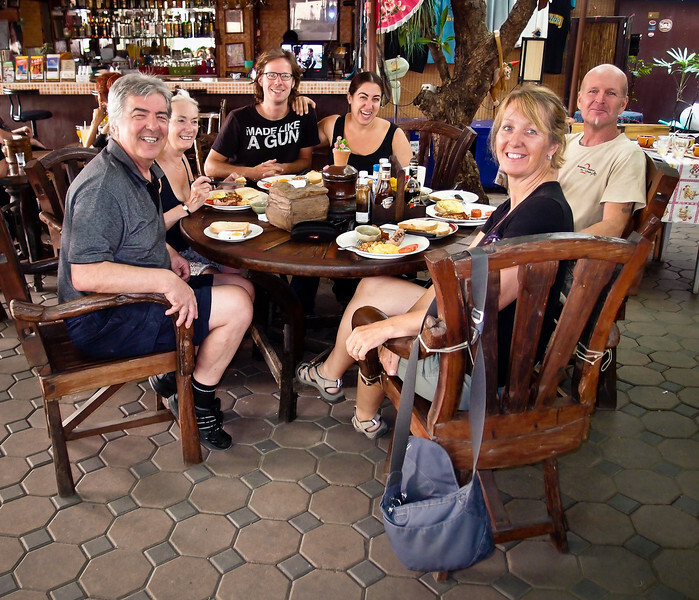 'Pākehā' (pronounced: 'pa-kee-ha') - A Māori language term for people who are "of European descent"
'Farang' - A generic Thai word for someone of European ancestry - read: scruffy westerners, especially backpackers - no matter where they may come from. Farang is also the Thai word for the guava fruit. But of course, I digress ..
.. as we ride ever northwards along the narrowest stretch of territory in Thailand; and pass through the city of Prachuap Khiri Khan, which is only 10 kilometres (6¼ mi) from the Burmese border at Sing Khon in the Tenasserim Hills. 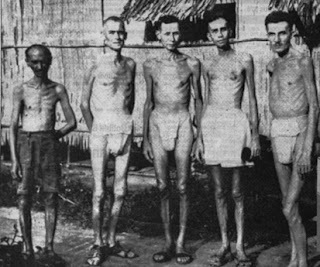 Prachuap Khiri Khan (PKK) hosts a Royal Thai Air Force base, and was an invasion point for Japanese troops on December 8, 1941, during World War II. It's also the pineapple capital of Thailand - delicious juicy (and cheap) pineapples growing wherever you look. Ao Manao Beach, just out of town (south) from Prachuap Khiri Khan. Panorama - click to enlarge. We wouldn't be seeing too much, if any, of the ocean from that time onwards, as we were due to head north-westwards inland the following day, Mon-18th. We stopped at the seaside town of Cha-am that particular night, which is about 130 km [81 mi] further up the coast from PKK. And here's my point about lodgings and our budget etc. We stayed in a very ordinary hotel en-suite room, quite unmemorable - in fact, I've already forgotten the establishment's name - but it was entirely adequate, with air-con, TV and a small but functional bathroom. 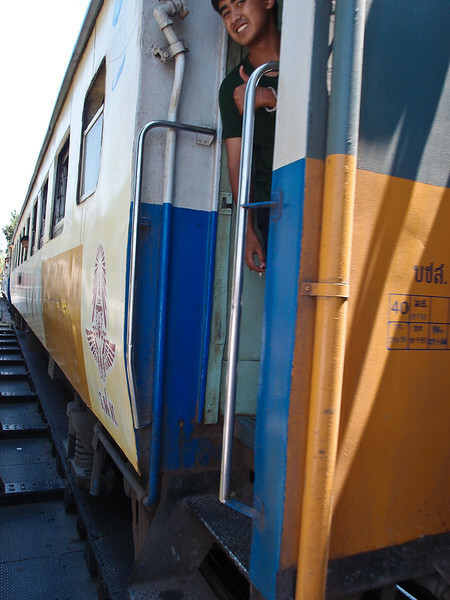 The nightly tariff was around 1,000 baht - about 20 quid [US$34] .. BUT this left enough spare cash out of our daily allowance to wine-and-dine at the fabulous Raya Resort Restaurant, no more than 100 metres up the seafront promenade from said hotel. 35° - over 40°C .. and it was bloody HOT .. too damn hot for our liking. 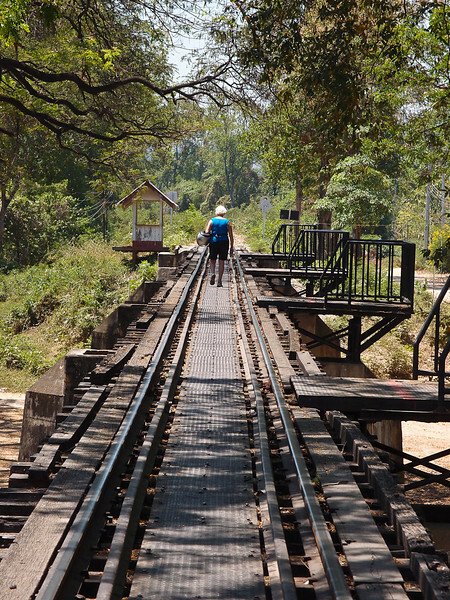 Kanchanaburi - location of 'The Bridge on the River Kwai' - or is it? Click → this link for more details. Immortalised in David Lean's 1957 film of the same name. There were actually two bridges here, both built by prisoners of war - The first (wooden) bridge was completed in February 1943, superseded a few months later by the steel bridge which you see above. 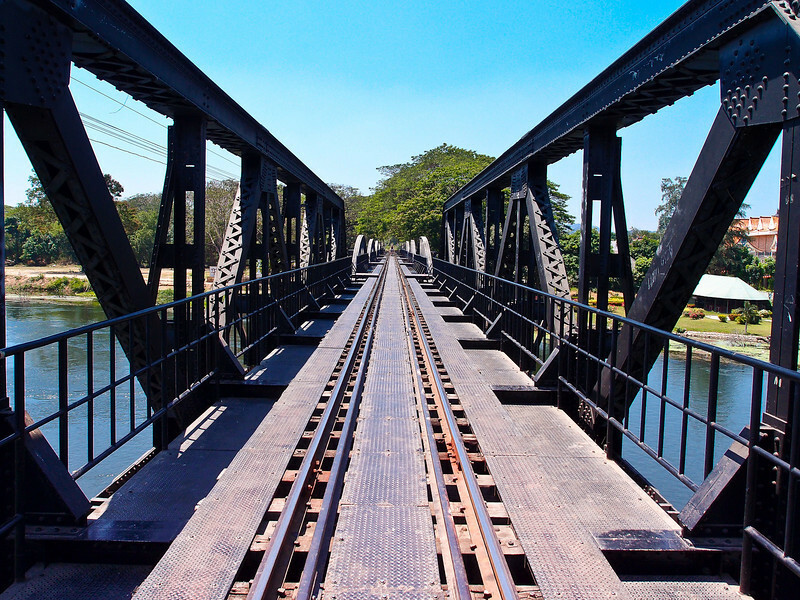 The curved steel bridge spans are original, and were brought from Java, Indonesia, by the Japanese. 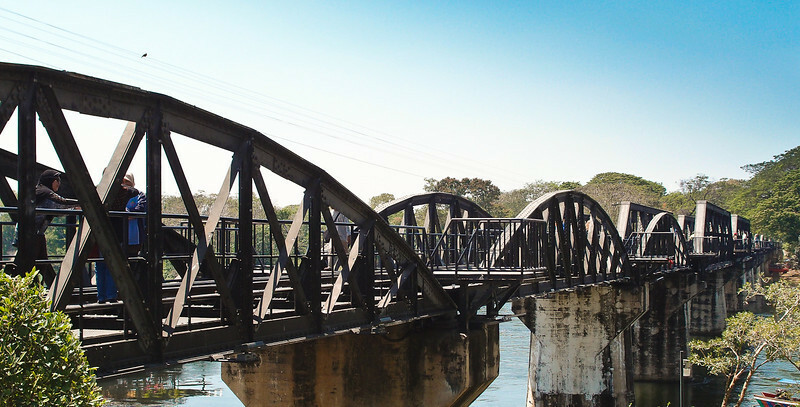 However, the two straight-sided spans come from Japan, and were installed after the war to replace spans destroyed by allied bombing in 1945. 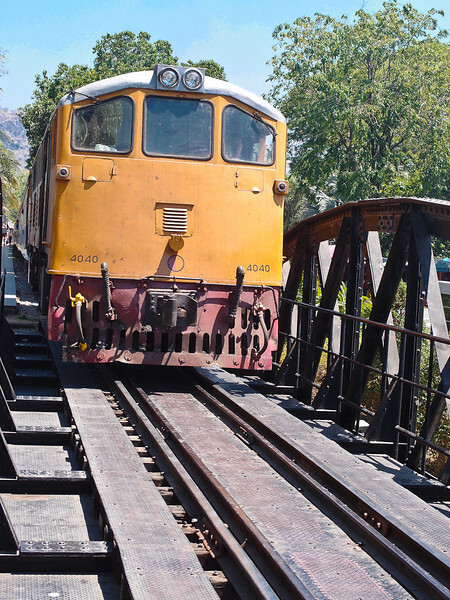 The Bridge carries the main line to/from Bangkok. 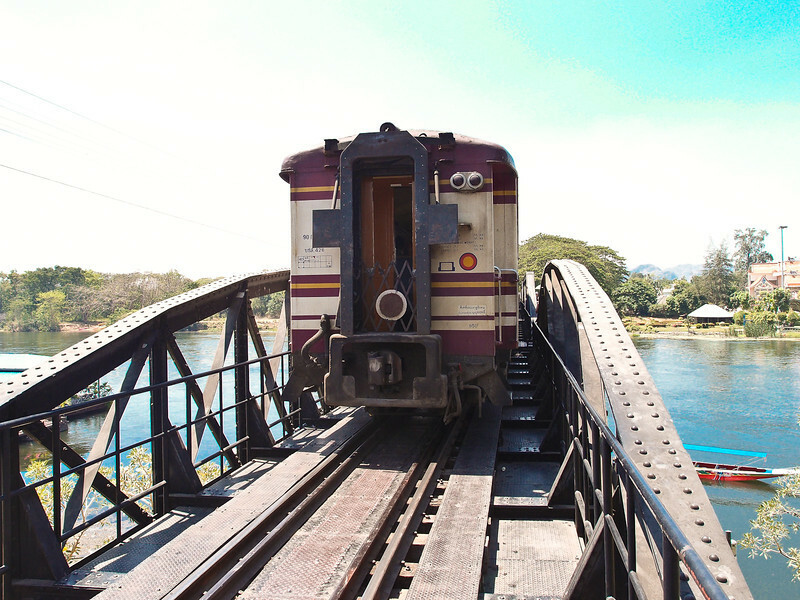 When we were there, actually on the Bridge, a train came through. Prat on the train. Clearly not the train company's Health & Safety Officer! The train passes - and we were still alive .. YAY! Ellen was determined to walk the entire length of the Bridge. Halfway across - the view looking west. 'Er Indoors walked the whole length; through into the wilderness beyond. I was content just to take a picture or two. Where I was stood, in the picture above, was far enough for me. It was just too flippin' hot. 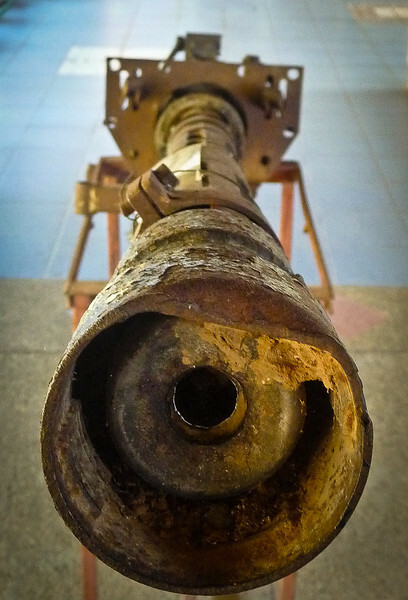 Staring down the barrel of a rusting WWII Jap machine gun. There's a museum closeby the Bridge. The JEATH* War Museum. 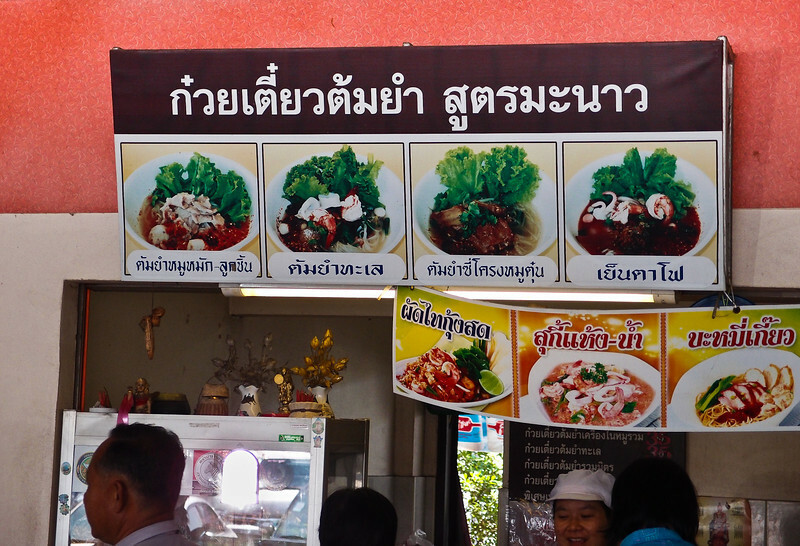 We paid the admission fee of 40 Baht [GB£0.90] and took a wander around. 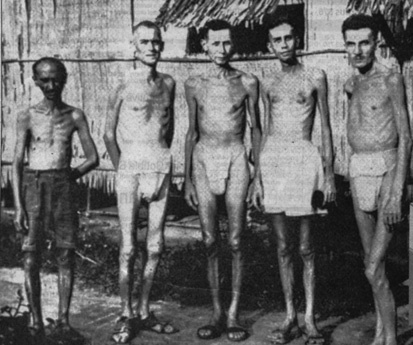 * 'JEATH' is an acronym for the primary nations which participated in the local wartime action. These nations are: Japan, England, Australia, Thailand and Holland. At first view, superficially, the items on display looked like the sort of collection of stuff that you might see at any Sunday morning car boot sale in England. On closer inspection, however, it was all quite fascinating; steeped in 20th century wartime history - from the Asian-Pacific perspective in particular. 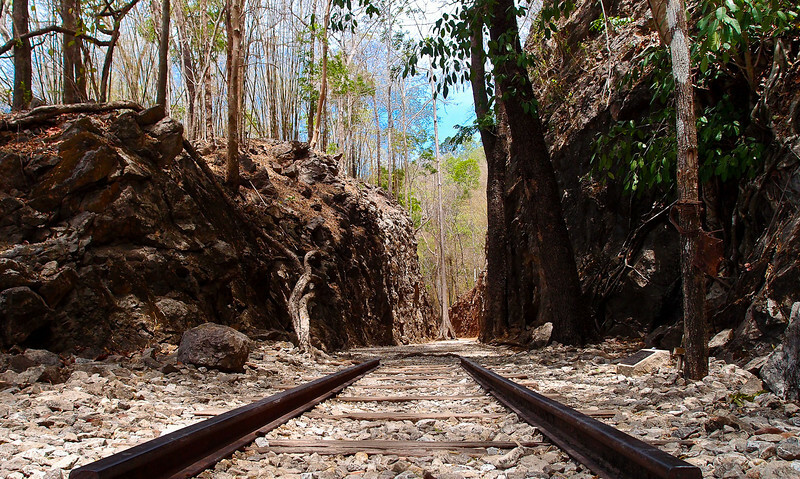 Hellfire Pass, part of the Burma Railway, also known as the 'Death Railway'. 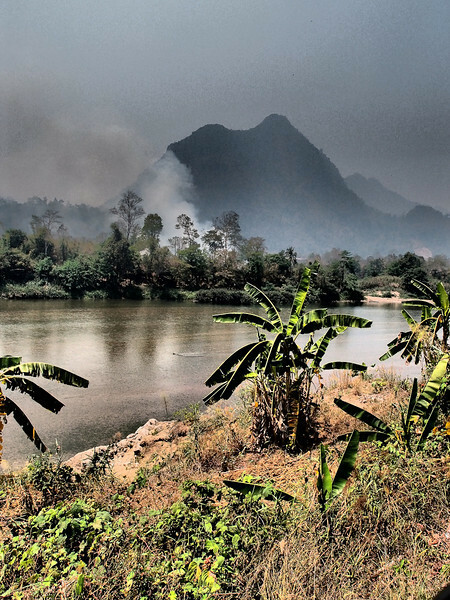 Located about 80 km (50 mi) north of Kanchanaburi. 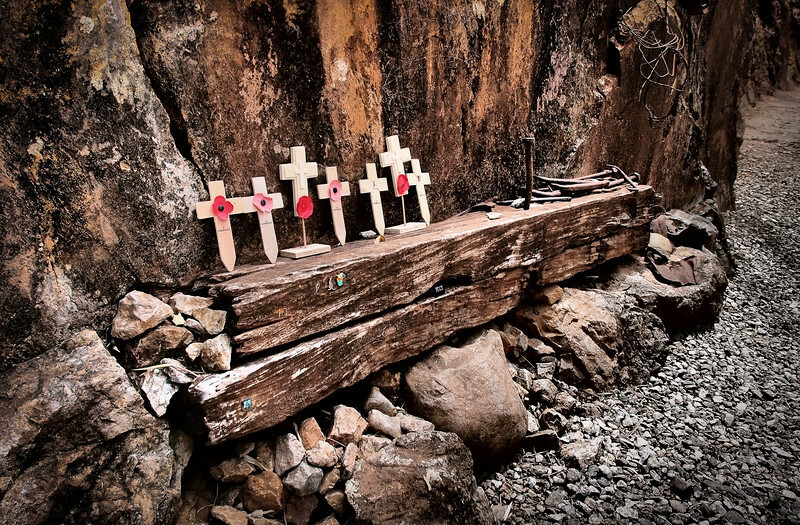 Here, the Australian government has cleared about 7 km of the old track-bed as a memorial to the 13,000 allied prisoners and 80,000 Asian labourers who died building the railway. We walked about half way along the cleared track .. but the heat got the better of me. I was wearing trainers and the thin soles are just a bit too soft and vulnerable for a stony rubble surface. It was a solemn and bloody sobering experience. I won't go into the detail of what went on, and why .. as there's plenty of information about the Death Railway to be found on the web. Poor buggers. There weren't a lot of Japanese tourists around that day. In fact, I didn't see any. Shame on them. 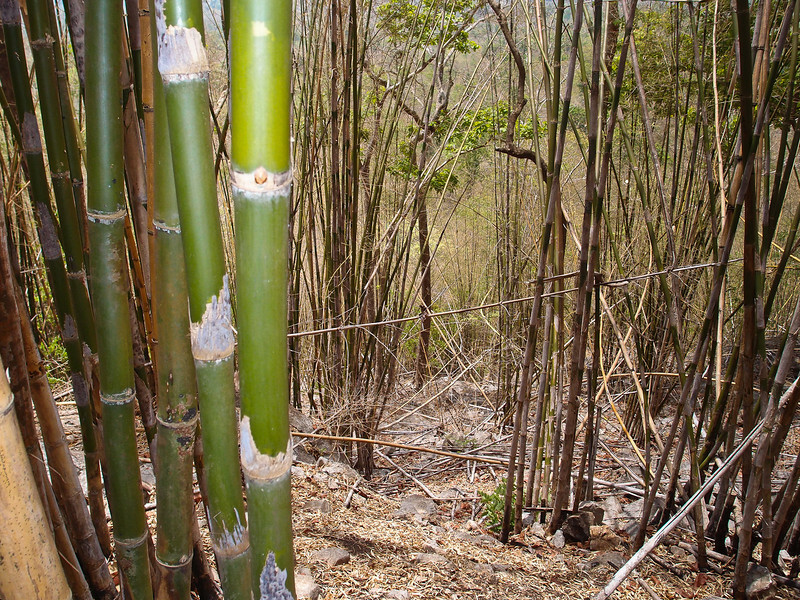 There's plenty of bamboo growing around in these parts, which was a vitally important material for the prisoners. They made everything they needed from the stuff. You name it .. and they made it out of bamboo. This clearing was a teak forest. All chopped down during 1942-43 and used in the construction of the railway. See those mountains on the horizon? That's Myanmar (Burma). This is how close we were to the border at Hellfire Pass. 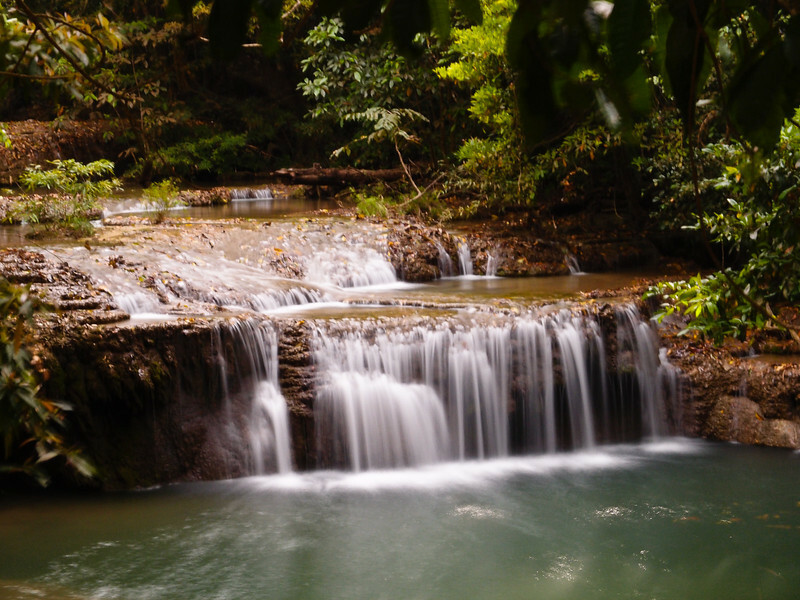 On the way back to Kanchanaburi, we diverted off to the Erawan Waterfalls. My word it was very HOT that day. Up into the low 40 degrees C. Looking back, it was perhaps an unwise decision to visit two places of interest in one day. 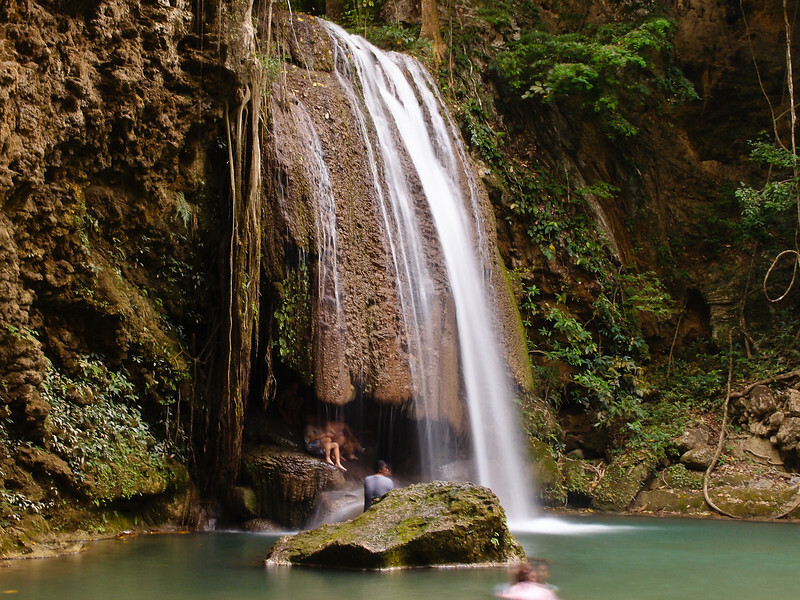 Erawan is an impressive series of seven waterfalls, each with a shape and character all of its own. You can swim in the plunge pools at the base of each waterfall. Ellen took the plunge at Level 3. I think we managed to get up to level four before turning back down. Thoroughly soaked through with perspiration .. pouring from both of us. I used my new ND (Neutral-Density) Filter to help create the silky smooth 'candy floss' effect to the flowing waters below. I'm not sure I like the results though? 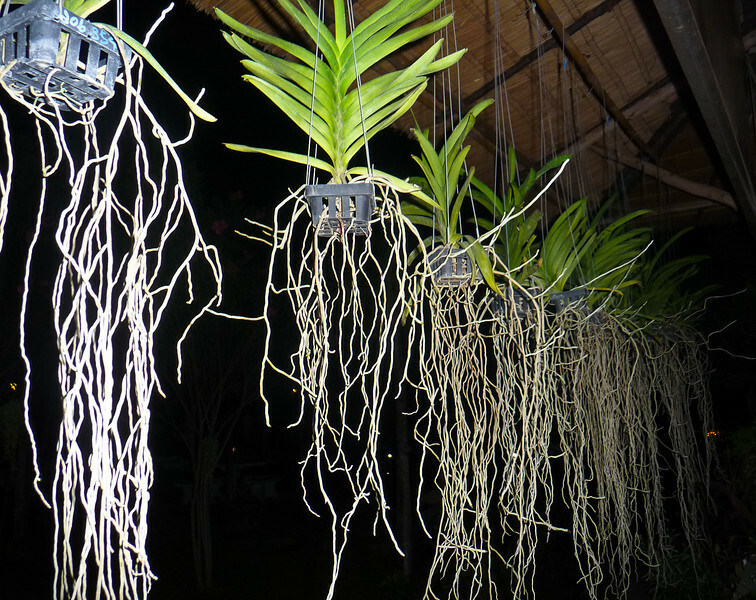 Air Plants (Tillandsias) growing above and around our restaurant table. During the four days from Thursday March 21st to Sunday 24th (inclusive) we covered a total of 930 km [578 mi] in a generally northern direction from Kanchanaburi to Chiang Mai. The first half of this distance was mainly fast and furious motorway riding, which inevitably meant the odd refuelling stop here and there in highway service stations, which we tended to time-in with our lunch breaks. .. or howzabout a plateful of one of these unfamiliar culinary concepts? .. or you could always ask for a bowlful of one of the above equally strange offerings .. eh? But that's the fun of foreign travel, isn't it? You don't know what people are talking about, and you barely understand any of their language .. let alone their alphabet. I just can't think of anything that excites a greater sense of childlike wonder for a grown adult than to be in a country, such as Thailand - or Laos and Cambodia which both lay ahead - where you are ignorant of almost everything. Suddenly it’s just as if you are four years old again. You can't read anything, you have only the most rudimentary sense of how things work, and you can't even reliably order a basic meal without embarrassing yourself. Your whole existence becomes a never-ending series of intriguing guesses. And I love it all. 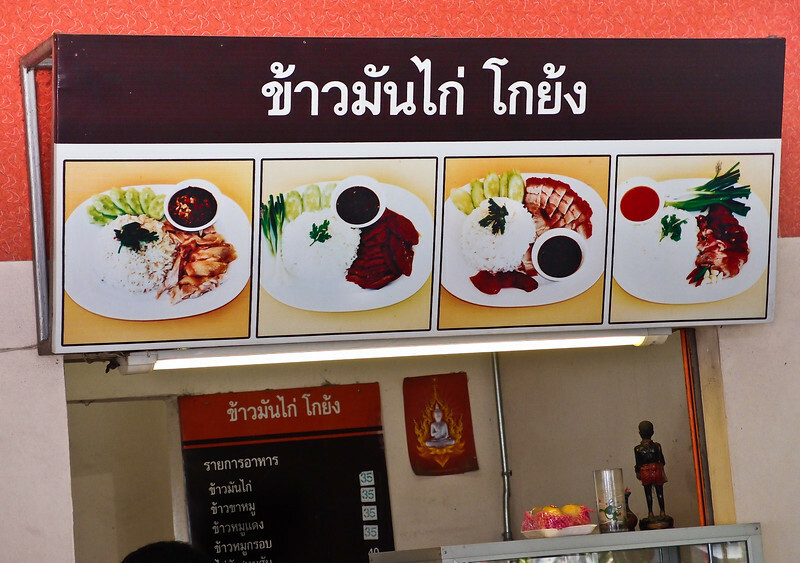 By the way, the best trick is to watch what the local Thais chose to eat at the service counter, always accompanied with the mandatory couple of heaped kitchen spoonful's of boiled rice of course; if you fancy what the Thai bloke queued in front of you has picked from what's on display, then smile nicely at the young server-upperer .. point at the aforeserved customer's dish .. and give the thumbs-up. 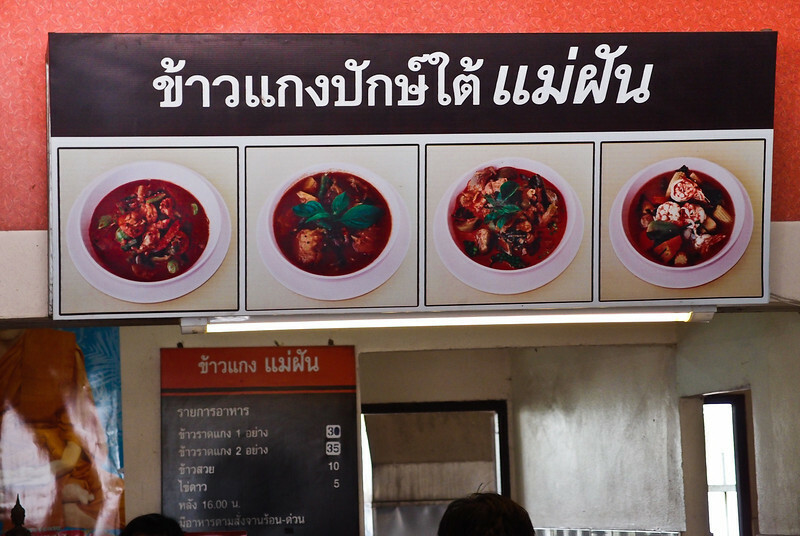 It could contain any sort of meat of course; pork, duck, chicken, goat, squid, mongrel or pedigree (unlikely). You just take pot luck. You sometimes get back a warning remark from said concerned-looking server-upperer, as she wafts her hand frantically up-and-down her partially opened rice cake-hole, "Oh .. but dishing's wherry spy-zee HOT meestir!" As I say, you just take your chances .. and usually at a cost of no more than around 40 baht [GB£0.90] including a bottle of ice-cold spring water. It's all a world away from our typical British motorway service station restaurants, in every respect. The 235 km [146 mi] northerly ride from Mae Sot to Mae Sariang turned-out to be quite an arduous journey. A super smooth highway - the 105 - soon turned into a broken potholed track which meant I had to concentrate very hard on the road surface .. and keeping us upright! At times we were very close indeed to the Myanmar / Burma border. We came across a refugee camp, pictured above. A shanty town really, crammed-in like sardines in a tin. Each tiny house built from natural local materials; now ultra-dry at this time of year. HIGHLY inflamable, of course - see the news article below. This is one of nine refugee camps on the Thai-Myanmar border set up more than two decades ago to offer asylum for Burmese fleeing the fighting between the Myanmar army and rebel troops. There are an estimated 140,000 refugees in camps in Thailand. After a new quasi-civilian government replaced the long-ruling junta in Myanmar two years ago, Thailand announced it wanted to shut the border camps, raising concern among their residents. But so far the displaced residents have been allowed to stay and the Thai government has stressed that it will only send them back when it is safe. 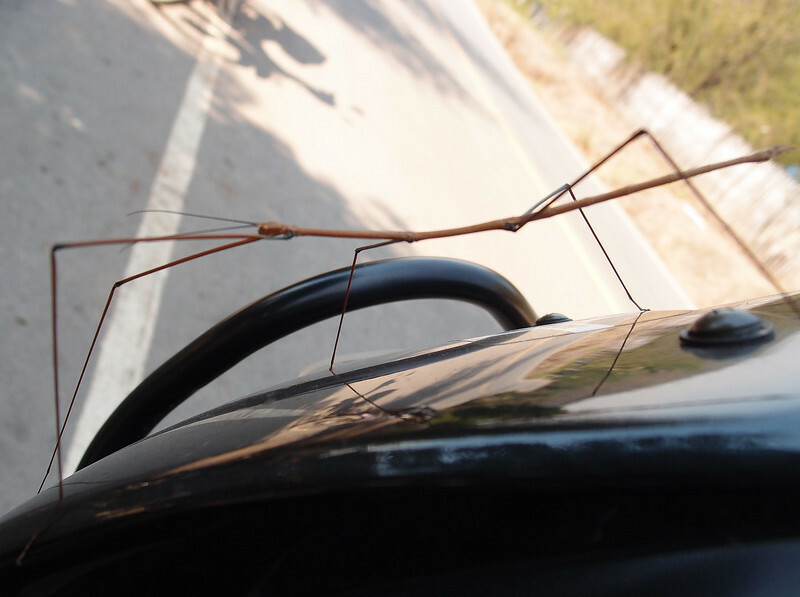 A stick insect trying to cadge a lift on my front fairing! About a third of the day's ride behind us and we started running along the east bank of the River Moei, which forms a natural border between Myanmar and Thailand. Unlike most rivers in the region this one flows north, in a north-westerly direction. At time the river became so narrow and shallow we felt we could have waded across into Myanmar had we chosen to. It was then we noticed the wildfires; turning the sky very dark at times, which we were heading straight towards. 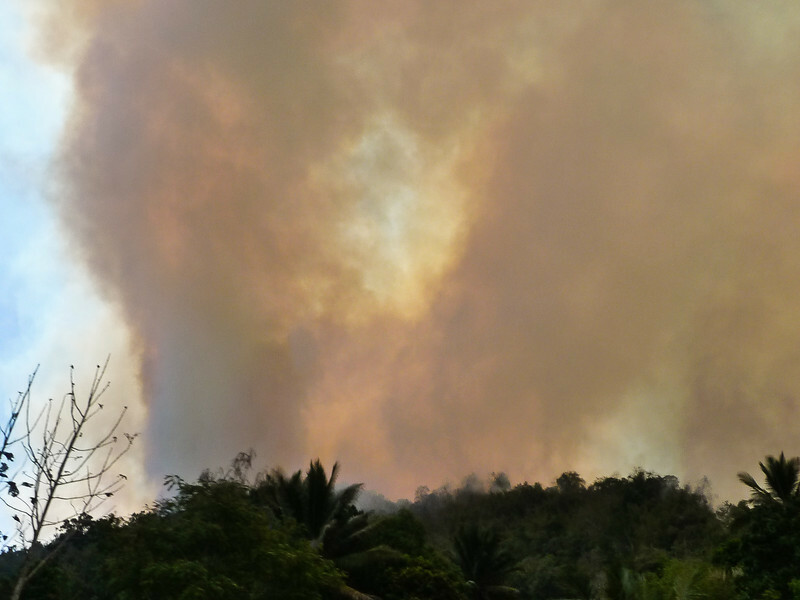 Thick acrid smoke that choked us and made our eyes sting. 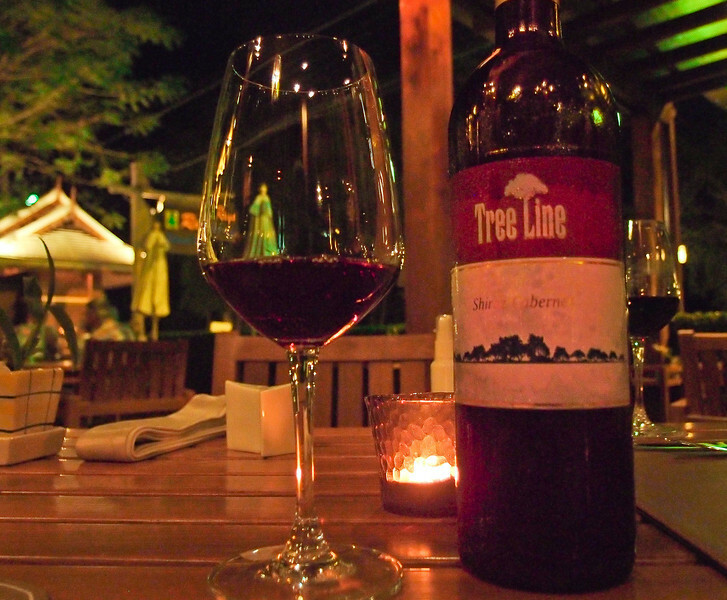 The City of Chiang Mai; the cultural capital of northern Thailand. This is exactly where I wanted to be at this stage. We're roughly halfway through the trip; the timing is bang-on. Exactly on budget too. 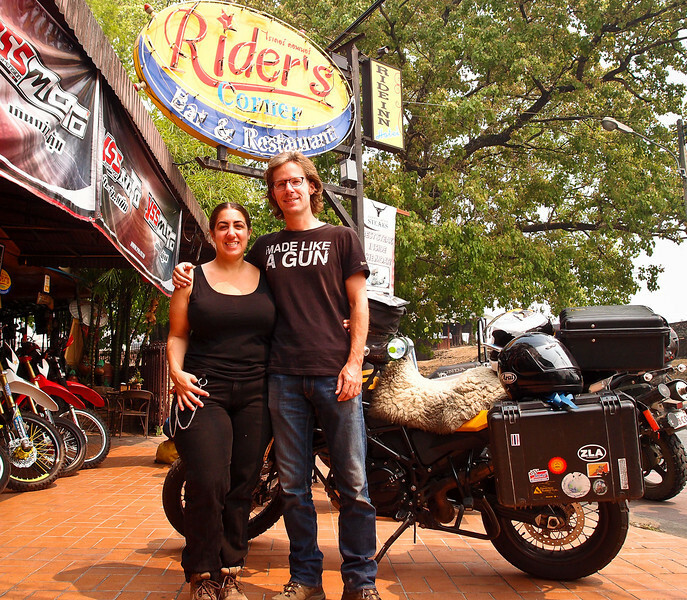 Jeff and his partner Si, out from Washington DC America, just riding around the world on a BMW 800GS in a generally west --> east direction. They've already been on the road for 10 months. We hope to see both couples again. C&C when they eventually arrive up in the English Westcountry towards the end of this year (2013); and ..
Jeff & Si within the not too distant future, either somewhere in Laos and/or Cambodia, especially as they are travelling more-or-less around the same route as us during the next month or so. 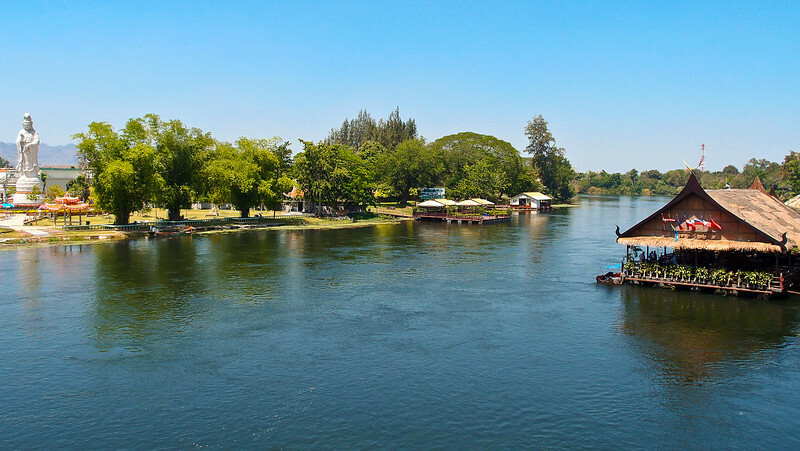 The border townships of Chiang Khong (Thailand) and Huay Xai (Laos) on the Mekong River. More in about a week's time, subject to decent internet access. 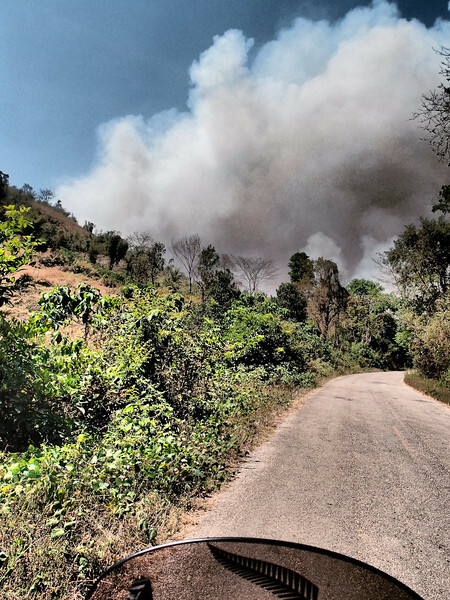 Just north - about 100 km [63 mi] - from our night's stopover in the riverside township of Mae Sariang, one of the wildfires swept through Mae Surin refugee camp. MAE HONG SON: At least 62 people have died after a fire swept through a refugee camp in Mae Hong Son and the death toll could rise further, officials said on Saturday. About 30 refugees were originally reported killed when the fire broke out at about 6pm Friday at the Mae Surin refugee camp in Khun Yuam district of the northern province. Dr Paisarn Thanyawinitchakul, the chief of Mae Hong Son Public Health Office, said 32 more bodies had been found in the burned camp and the death toll could rise further. He said most of the victims could not escape the blaze and some died of suffocation. A senior national intelligence official said most of the dead were women, the elderly and children. About 200 people were injured and were being treated in hospital. 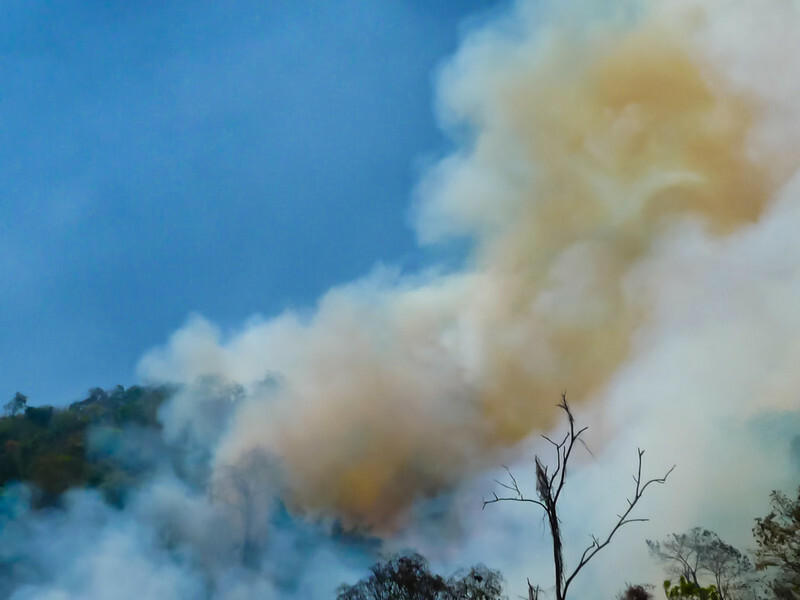 Khun Yuan district chief Sangkom Klapthiangsaen said the blaze, apparently sparked by a cooking fire, burned more than 300 huts, mostly made of bamboo and roofed with dried grass, before it was brought under control on Saturday morning. Security sources said the blaze was not an act of sabotage, and confirmed that it was caused by an accidental cooking fire. Rescue workers were on the scene at the remote mountainous camp area, Mae Hong Son provincial governor Narumol Paravat told AFP by telephone. 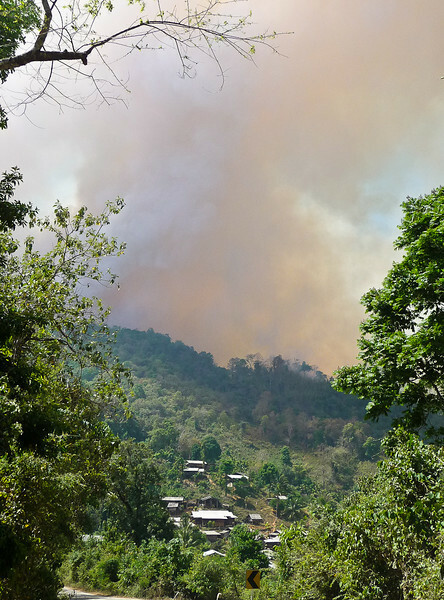 Hospitals in Mae Hong Son had dispatched teams of medical personnel to tend the injured. Chatchai Promlert, director-general of the Disaster Prevention and Mitigation Department, said he had instructed the department's regional centres to assist as well. A school, clinic and two food warehouses had also been destroyed, the department reported. Temporary shelters for the homeless are being provided by the International Rescue Committee (IRC), the United Nations High Commissioner for Refugees (UNHCR), the Jesuit Refugee Service (JRS) and the International Organisation for Migration (IOM). "We have been able to get into the camp with food supplies and plastic sheets for shelters," said Vivian Tan, a spokeswoman for the UNHCR. 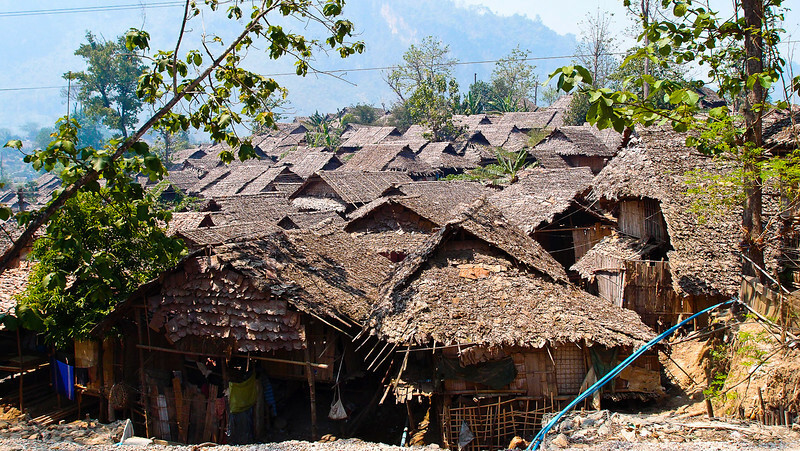 The camp, located about 90 kilometres west of Mae Hong Son town, houses about 3,300 Karen refugees, she said.